We’ve made it to the middle of the week and now we’re on the down-hill to the weekend! Yay!!! Today I thought I would share with you a most beloved and favourited recipe of mine that I absolutely love to bake as the warmer Spring days slowly come back into our lives! And that recipe is… Shortbread! Usually, I make it with a good handful of orange zest, but today I was feeling brave and choose to see how well it tastes with lemon zest instead! (Oh!! The fresh sweet smell of lemon filling my kitchen was just simply devine!) By adding the lemon or orange zest, it will just give the Shortbread a lovely subtle fresh fruity flavour that will make you go back for more and more! So here’s how to make this delicious and fail-safe Lemon Shortbread! Begin by preheating your oven to 150C/300F/gas2. Then butter well a square slice tin measuring about 22cm or 9″. 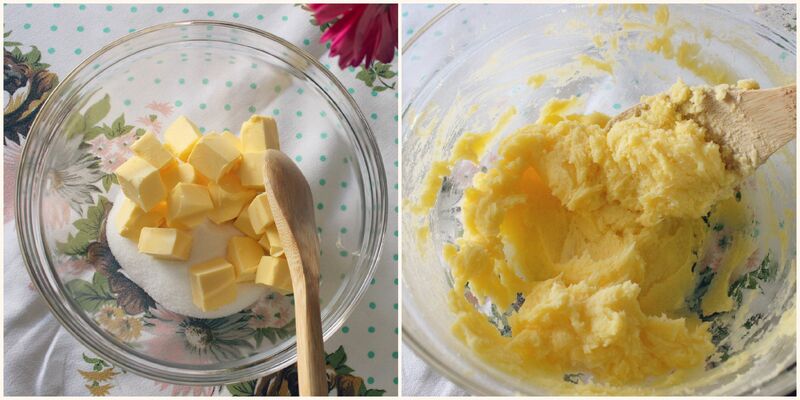 Place the butter and sugar in a large bowl and cream them together using a wooden spoon until it looks light and fluffy. 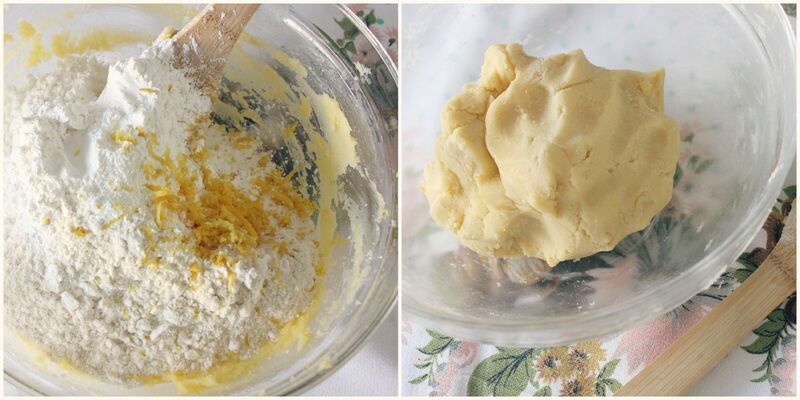 Add the plain flour, cornflour and lemon zest to the buttery mixture and gently fold them together with your spoon. Then get your clean hands into the bowl and mix until you have a lovely smooth dough. 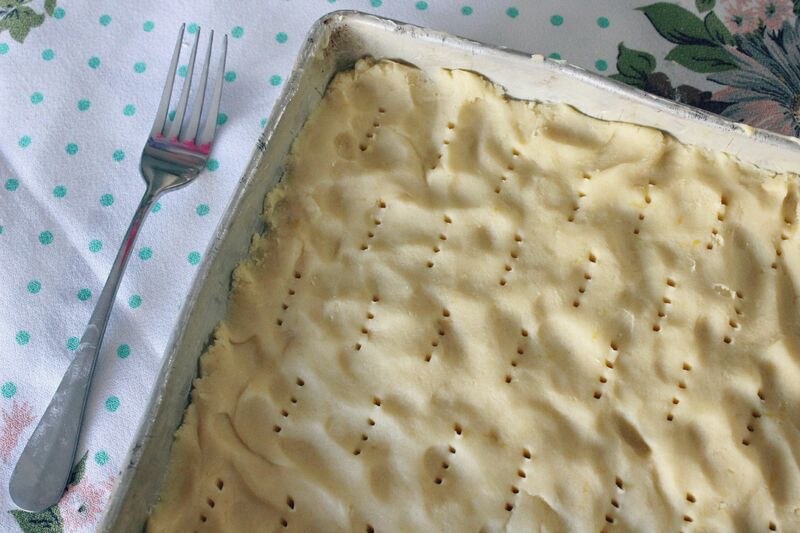 Place the dough into your buttered tin and press it evenly throughout the tin and into the corners using your fingers. (The rougher looking the better!) Before popping it into the oven, grab a fork and prick the surface all over. Place it into the oven for about 50 minutes until the top of the Shortbread is looking lightly golden brown. 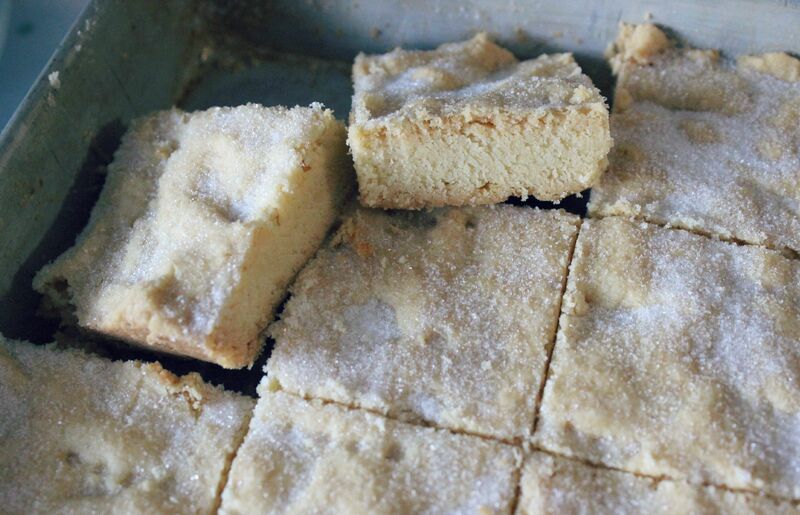 While the Shortbread is still oven warm, cut it evenly into squares and sprinkle a generous amount of caster sugar over the top. 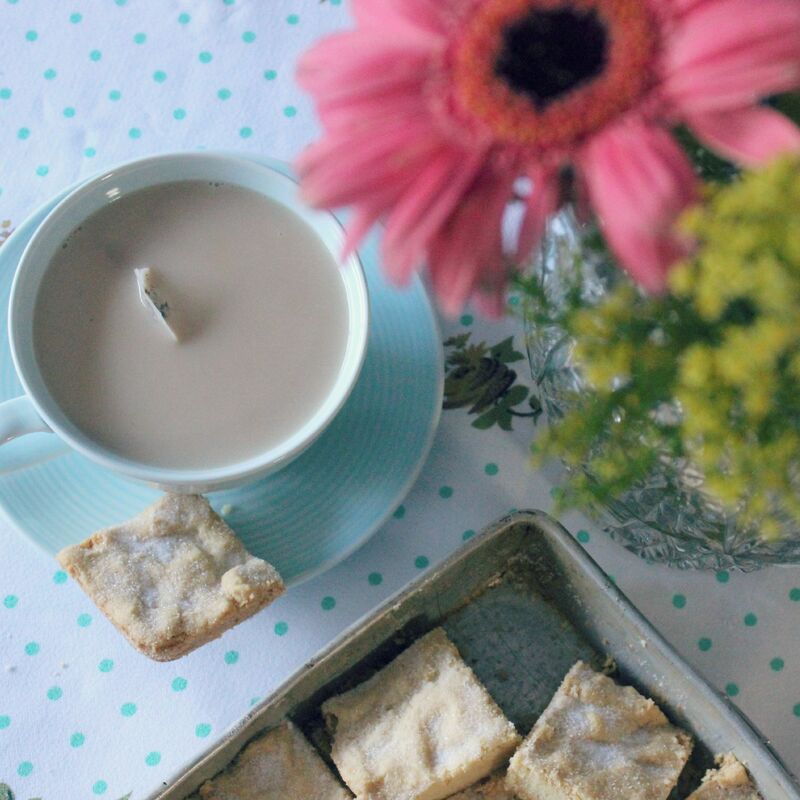 This Shortbread is best enjoyed with a lovely hot cup of tea! Recipe adapted from one by Jamie Oliver called ‘The Best Shortbread in the World’ from his book, Cook With Jamie, published in 2006. Let me know if you’re going to give this recipe a go! Even if you’re not the best chef in the kitchen, this Shortbread is insanely easy to make and just as easy to eat as well!! Love lemon. But what is corn flour? Is it corn meal? 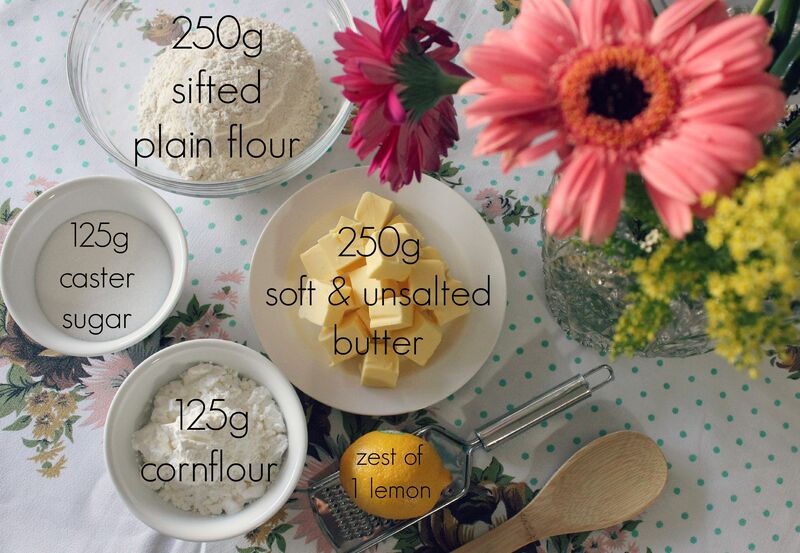 Cornflour is like a really soft like flour that will help give the shortbread a light crumbly texture. If you’re unable to find cornflour at your supermarket, the recipe suggests that you can use Semolina as well. OMG I love love love LOVE short bread! But I like it traditional w/ no flavorings … think this recipe would work if I left the lemon out? Also, on an un-related to baking topic – I paper pieced for the first time yesterday and thanks to your video on youtube it was a breeze. I was surprised at how easy it was once I got the hang of it. But I do have a bad news bears about the bit … I didn’t know there was plastic melted on my iron which transferred to the bodice of my little ballerina when I ironed it 😦 😦 😦 it’s not a big spot, but it now looks like my ballerina has a dirty spot on her outfit! do you have any advice for how to remove it? I tried googling and some sites said to try nail polish remover – and I haven’t yet but I might — I just wondered if maybe you had any advice? I could always re-make it if I have to – it was that easy – I just would probably have to buy more fabric and thought I might try to save the one I’ve already done. Yes! You can definitely make this shortbread without the flavourings! It still tastes just as lovely!